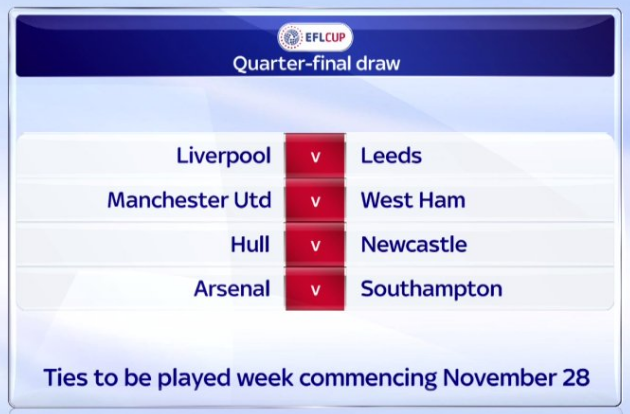 Wednesday night’s draw for the EFL Cup quarter-finals has been kind to the three remaining heavyweights, after a night of action which saw Manchester Utd get one over on local rivals Manchester City, West Ham knock out Chelsea in east London and Southampton beat struggling Sunderland 1-0 at St. Mary’s. Arsenal, who cruised past Reading at the Emirates on Tuesday, face Claude Puel’s Saints in north London while Jose Mourinho’s Red Devils will play host to West Ham at Old Trafford. Liverpool, who knocked out Tottenham on Tuesday, will play Championship side Leeds United at Anfield while rounding out the draw, Premier League side Hull City face Rafa Benitez’s Newcastle United at the KCOM Stadium. Should be a decent set of games!